This review appeared June 16, 2014 in the Best Shots column over at Newsarama. 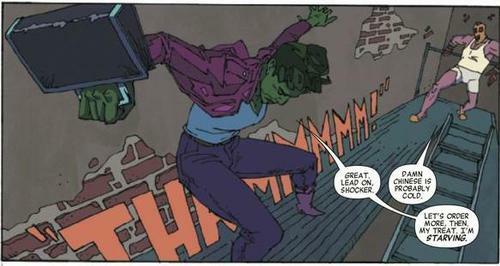 In She-Hulk #5, fill-in artist Ron Wimberly presents an alternate vision for what this character and story could be. The dramatic change in art comes just as Charles Soule’s writing is hitting its stride. This issue is wonderful as its own entity, but will strain some readers’ connection to the heroine they thought they were getting to know. In its first four issues, She-Hulk took us on a campy little jaunt with Jennifer Walters, city girl and hulk-lawyer. The story was cleverly put together and always had a feeling of style over substance. Javier Pulido’s panels fit neatly together and the objects within them didn’t seem so much composed as merchandized, like product in a high-end boutique. He was selling us the bold shapes he designed, including Jennifer Walters’s big green head. He made her eyes exactly the right size and shape to balance her deadpan with sweetness. He gave her just enough affable clumsiness to make her lovable despite her glossy exterior. We couldn’t quite gain purchase on her rounded, unblemished surfaces but we didn’t mind because the story was always about bright colors and fun. Wimberly’s She-Hulk still has bright colors and fun, but his art is much more angular and kinetic. His fisheye angles and busted-up facial planes bring shadow and depth into his panels. Wimberly drains the quirky-cute out of She-Hulk, and tempers her prettiness with don’t-give-a-damn rock ugliness. It suits her disaffection, and it suits Charles Soule’s writing. In earlier issues, Soule wrote Jennifer as discriminated against and down on her luck, but the art was too full of fun rom-com coding to make that stick. Even her hard times were spiffy and aspirational. The way Wimberly draws Jennifer, it’s easier to believe that her feelings are real. For this one issue, she can slouch on Shocker’s couch drinking a beer with him, her knees splayed just as wide as his. Pulido’s She-Hulk would have crossed her legs. Soule’s writing feels different in this issue even without the influence of Wimberly’s art. For the first time, he is telling a smaller piece of a bigger story. We’re finally down to the hinted-at blue file – a strange lawsuit against She-Hulk and several other supers. Angie Huang and Patsy Walker/Hellcat are deputized as She-Hulk’s agents and Soule does well cutting back and forth between these three threads. He fits them together to advance a single story with mystery, action, secrets and danger. The longer story arc gives him more room to fit conversations into his pacing. With help from Wimberly’s expressiveness, interactions are funnier and themes of what it is to be hero begin to emerge more clearly. I don’t think it will be easy for Pulido to step back into his gig and seamlessly take back art duties. This aesthetic change amounts to a protagonist swap and it will be jarring again when the two Jennifers are switched back. It doesn’t help that Soule chose Wimberly’s issue to get serious about his main storyline. The episodic stories of the first four issues seemed all right at the time, but now feel aimless and loose in light of the fifth issue. I don’t think four of those issues amount to a set-up for this fifth one. With very little adjustment, this could have been the first or second issue of the series. Readers loyal to Pulido might be put off by Wimberly’s fill-in issue, but it is simply too exciting to look at and too important to the story’s over-all development to miss. Enjoy it as an island unto itself and join me in regarding this series as an on-going experiment.